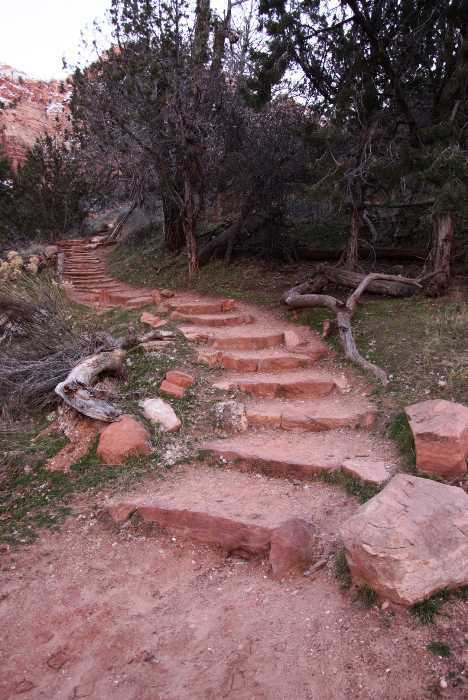 Zion’s Watchman Trail is a fairly easy, and fairly short, hiking trail that’s easy to access. 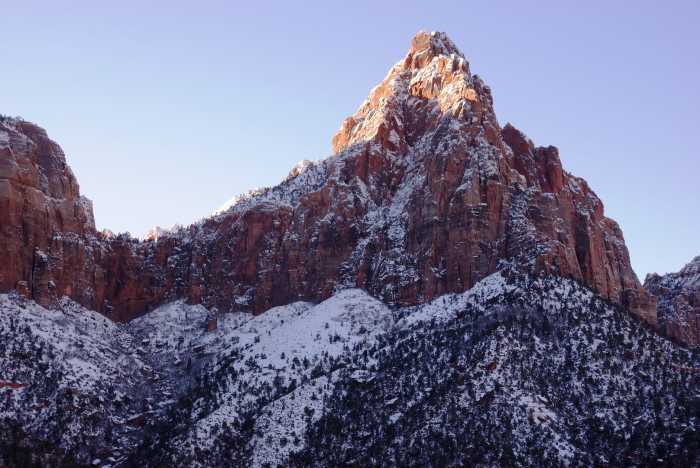 It doesn’t take you to the top of The Watchman — the big mountain looming over Springdale — but it does give you a nice viewpoint of this familiar landmark, as well as the town and the lower end of Zion Canyon. Hike it in the morning, and you’ll have a great view of the early-day sunlight hitting the cliffs to the west. Plus, if you’re hiking in the heat of the summer, a morning hike will keep you in the shade. 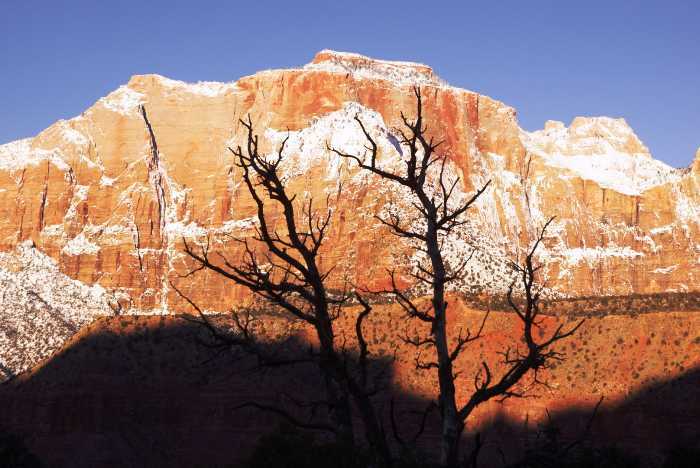 Zion National Park is located in southwest Utah, about an hour east of St. George. From Interstate 15, take exit 16 (or exit 27, if you are approaching from the north). Follow Utah Route 9 through Springdale and into the park. 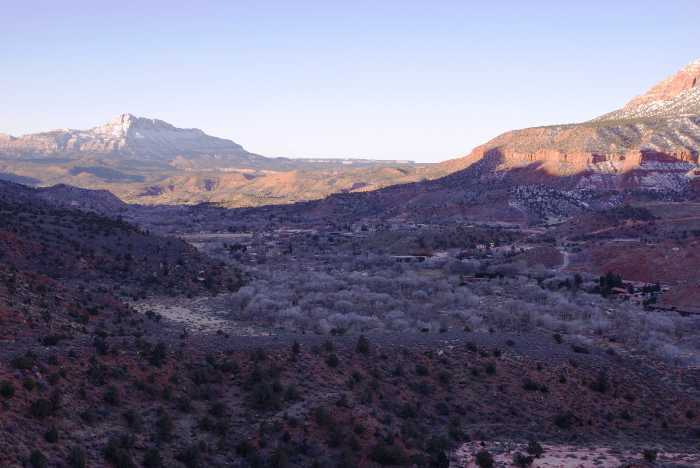 Route 9 runs through the park and continues east, allowing access from Kanab, Utah, and US 89. To access the Watchman Trail, park at the visitor center, just inside the park at Springdale. Signs will point towards the trailhead. 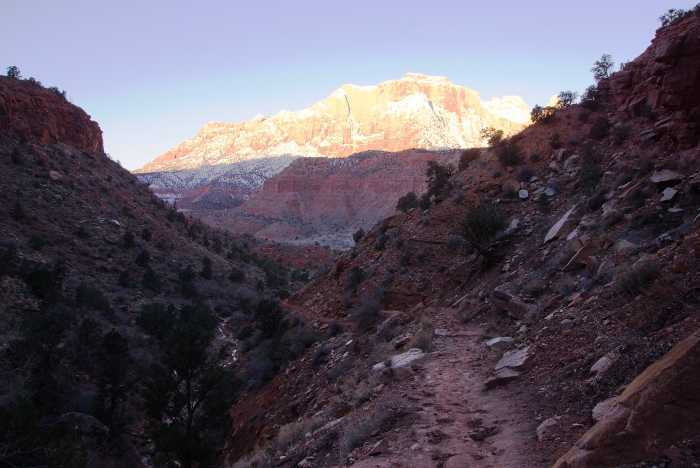 The Watchman Trail isn’t one of Zion National Park’s most exciting trails. That’s probably why, after a half-dozen visits to the park over the years, I never hiked it. But I finally did it, on the final morning of my six-day visit to Zion, in January 2017. The trail begins at the visitor center. 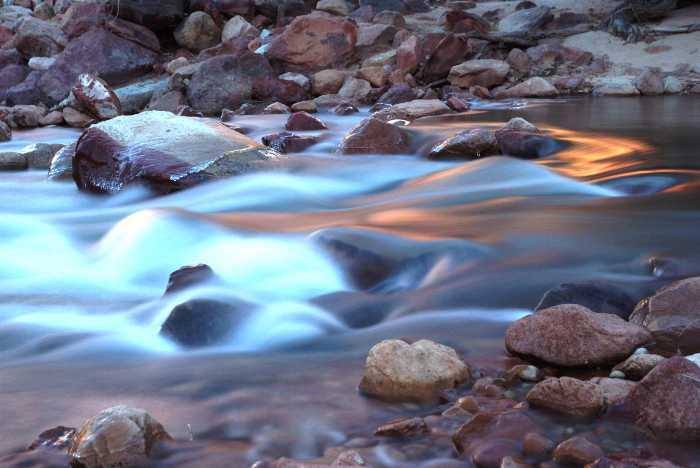 The first few hundred yards aren’t very exciting — you’ll walk past a parking lot and skirt the edge of the Virgin River. The river can be quite beautiful — especially when the surrounding mountains are lit with the morning sun, casting an intensely orange glow across the valley. Eventually, you make it past the expansive parking lot and a maintenance area, and the trail crosses the street. Here is where the hike actually begins — and so does the uphill climb. You’ll gain about 300 feet as you make your way up to the viewpoint. … back into a side canyon, and then make a hairpin curve, and continue up the other side of this hollow. I was here first thing in the morning, which made it tough to take a good picture — the distant mountains were bright, but the side canyon was dark. On the way up, you’re gradually getting closer to The Watchman, and the view improves. It was probably less than an hour after sunrise at this point, and as you can see, I was on the dark side of the mountain. 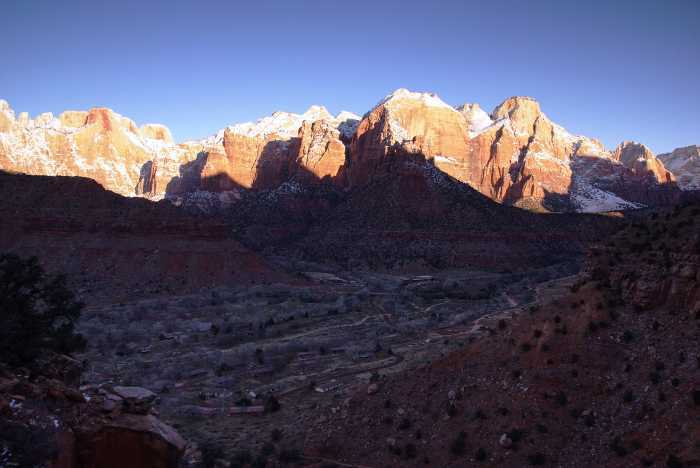 However, the view across Zion Canyon was getting better and better. The shadows were slowly sliding down into the canyon, and the cliffs were coming alive with a snow-frosted orange color. In the foreground, you can see the Zion South Campground. 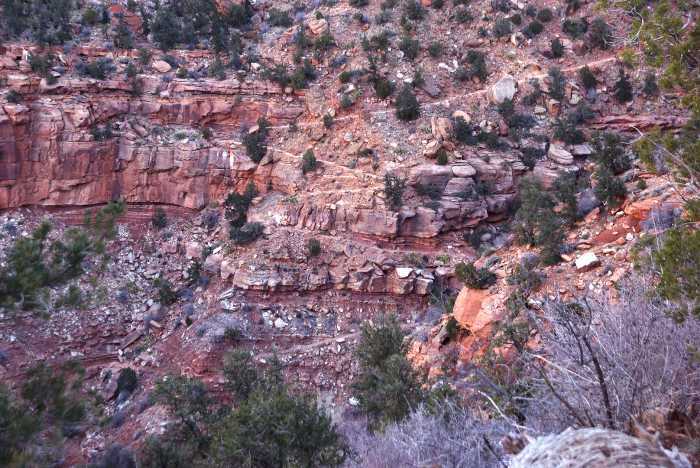 Looking across the side canyon, you may be able to see the trail across the way. Once I made it up to the top of the plateau, I had a better view looking south. Much of Springdale is visible from here, including my hotel — one of the buildings in the middle-right. I sure couldn’t have afforded a hotel room so close to the park at any other time of the year except January! … but now, a bit of light was making its way onto the peak of The Watchman. Because it was so early in the day, and so cold, I was the only person on the trail. As a result, it was very quiet up here, until I suddenly heard a rustling. 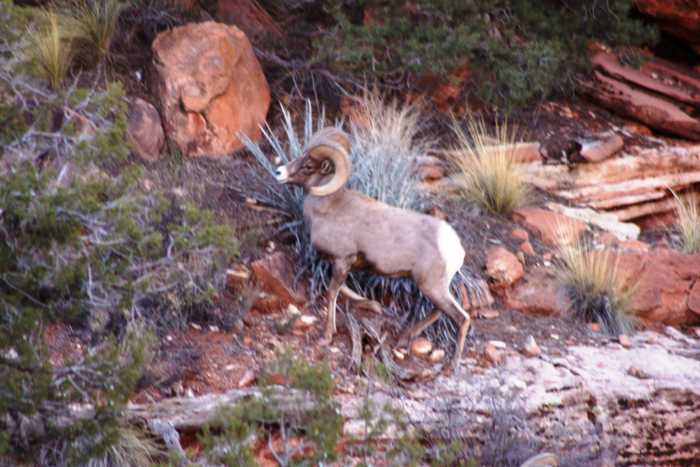 A couple hundred feet away, a herd of longhorn sheep came galloping up the mountainside. There were at least a half-dozen of them, but I only caught a good photo of one. They were nowhere near the trail, so they didn’t pose any danger. It was great to see some of the males, with their big horns, as opposed to the females that I had seen earlier on the trip. But the best part of the Watchman Trail was the view across the valley – especially when those cliffs were silhouetted by some of the skeleton trees on the plateau. 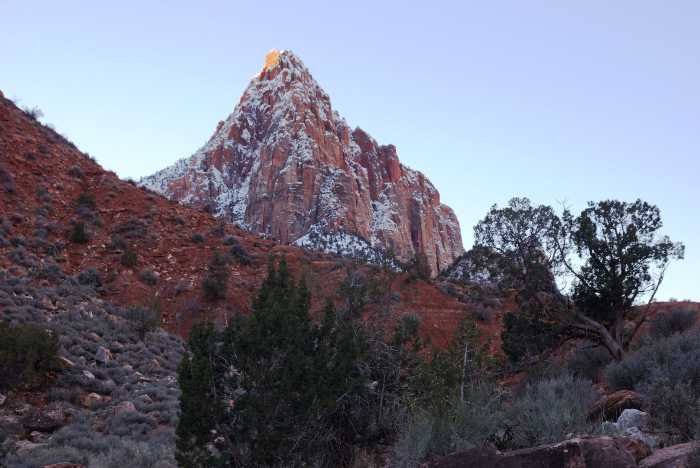 That’s the West Temple, by the way — one of the prominent mountains directly behind the Zion Human History Museum. You can check out a time-lapse of the sun rising on this mountain, and numerous other shots, in this time-lapse video. I hiked back down to the trailhead and finished the hike in about 90 minutes. And that was it. This was my final hike in Zion for this trip. After this, I drove to St. George, and spent the rest of the day visiting Snow Canyon State Park and the Dixie Sugarloaf. Here’s a look at the drive out of Zion National Park, headed to St. George and In-n-Out Burger. So I had always skipped the Watchman Trail because I didn’t think it was very exciting. Was I right? For the most part, yes. 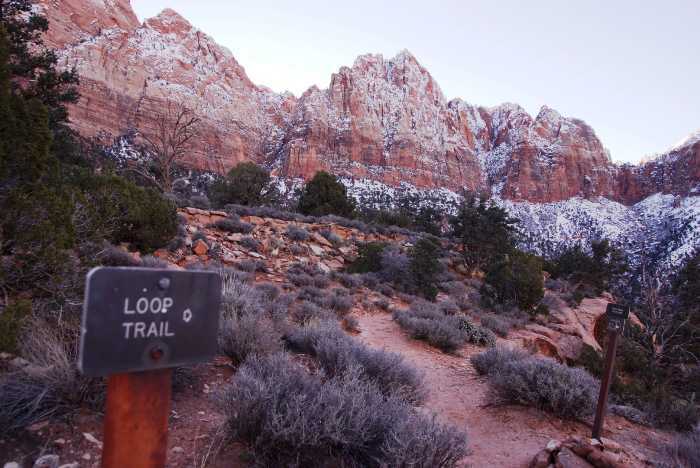 This definitely should NOT be the only trail you hike in Zion. It shouldn’t even be in the top five. But, the Watchman Trail does make a nice early-morning day-starter or a hike that could fill an extra couple of hours at the end of the day. It would be pretty good in the evening, for a nice view of The Watchman at sunset. It’s also not too challenging, so it could be good for families. But if I never have the opportunity to hike it again, I’m okay with that.